Built using standards-based Service Oriented Architecture (SOA) and open source Google Web Toolkit technologies, the Compiere Web architecture provides advantages for end user productivity, ease of customization and ease of management. The Compiere Web architecture is fully compatible with Compiere's Model-driven Application Platform which stores business logic in an applications dictionary for ease of customization without programming. Customize Windows, Tabs, Fields, Reports and more using your choice of Web or Java clients. The Web architecture provides application administrators with the same usability advantages available to end users. 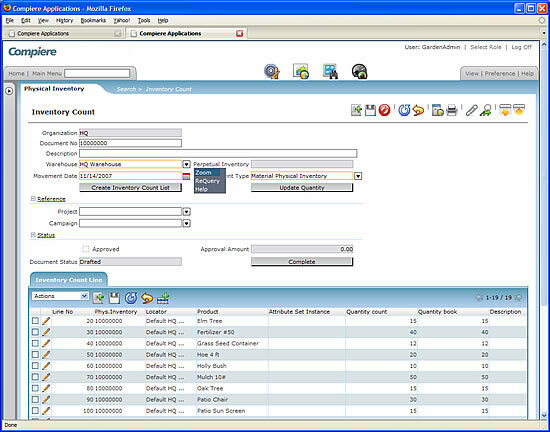 The Application Dictionary enables you to customize and store business logic once. Compiere ensures that your changes are rendered correctly in both Web and Java clients. The Compiere Web architecture generates significant cost savings by eliminating the installation, configuration and management of desktop client software. It is compatible with modern browsers such as Mozilla Firefox and Microsoft Internet Explorer and does not require client software or plug-ins. The flexible architecture is platform- operating system- and browser-agnostic, securely operates within most firewall configurations and supports the demands of a mobile workforce. The Compiere Web architecture makes intelligent use of network bandwidth and server computing resources. The Compiere Web client sends focused procedure call instructions to the server only when additional data is needed. The server replies by sending exclusively data. The Compiere Web client, resident in the browser memory, manages data presentation. This design is far superior to traditional web architectures that require the server to maintain state for each user, dynamically render HTML pages with every command, and transport fully formatted HTML pages across the network. The Compiere Web architecture is available in the Compiere Enterprise Edition. Watch a Google-produced Video featuring Compiere Developers discussing the usability and development advantages from Google Web Toolkit.